Get your car fixed right the first time. Honest work. Affordable prices. headlight restoration! Jeff's Auto Works is a full service auto shop. Jeff Priest is an ASE certified auto technician who has been serving the Central Coast for 28 years. 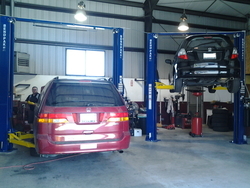 Working on a full range of vehicles complete with Smog Certification. Open Monday thru Friday, 8:30 a.m. to 5:30 p.m. Please call for appointment. Bring your car or truck in today for a FREE estimate!